It’s been a stressful week for me. The stress has nothing to do with working, or blogging, or filming, or anything else that would be expected. I never write about professional sports, but everyone who knows me away from the blog understands that, despite coming from New Jersey with few ties to Northeast Ohio, I’ve been a Cleveland Cavaliers fan since I was ten years old. It’s the only professional team that I follow. In the days before online streaming services, I could only see a handful of games per year on television, resorting to listening to them late into the night on AM radio that mysteriously jumped here all the way from Ohio come nightfall. Back then, my Dad would treat me and a friend of my choice to yearly trips to the Meadowlands to see Cleveland play the Nets when they came to town. In those nearly 17 years, being a Cavs fan hasn’t been easy. Countless coaches, general managers, and draft picks that never panned out. I stayed loyal nonetheless, and inherited a lot of sentiments from championship starved Northeastern Ohio fans – Cleveland has no title since 1964. 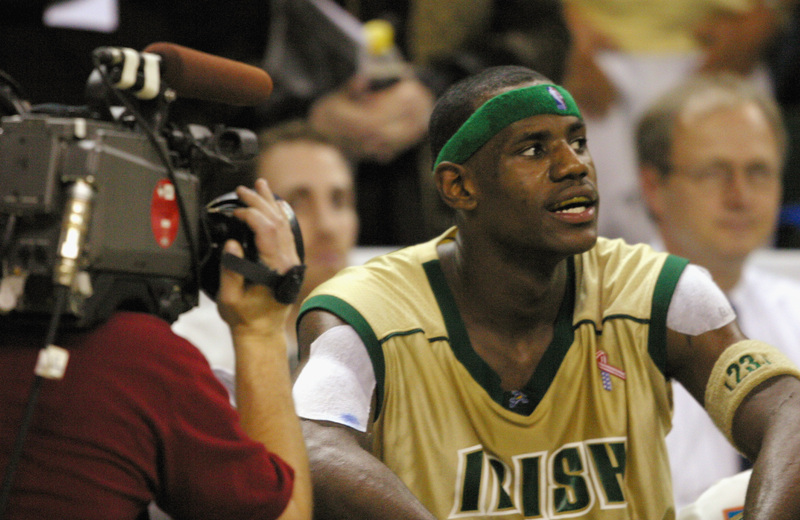 For the Cavaliers, luck changed in 2003, when Cleveland drafted Lebron James, a once in a generation sort of talent who just happened to grow up a half an hour from the city. James’ hype reached such heights that his high school games were broadcast on ESPN. Before he was old enough to vote, experts had him pegged as, potentially, one of the best of all time, and from his first game, he only exceeded expectations. His seven years in Cleveland, which included several phenomenal regular seasons and a trip to the finals, were like none before in Cavaliers history. James may have been the biggest hero there in half a century. This made it that much harder in 2010, when a frustrated James opted to “take his talents to South Beach,” leaving the fans on the shores of Lake Erie with a broken franchise. As he made his way to the Miami Heat, fans burned jerseys, broke down in tears, and made statements I can’t repeat about the man referred to as the “Chosen One”. Cleveland Cavaliers billionaire owner Dan Gilbert’s angry letter about James departure is still what he is most known for – that likely won’t change. People in large markets, such as our mega New York metropolis, don’t always understand the importance of sports and civic pride in smaller, rust belt markets like Cleveland which lead to such deep feelings of betrayal when James left. These markets are forgotten, laughed at, the but of jokes – not to mention somewhat deeper economic struggle. The smaller scales of the cities and their media allow fans to perceive a more personal relationship with the sports stars. For example, everyone knows where Lebron James lives – and they aren’t shy to visit. The fours years after James departure were painful to say the least. The lone real bright spot of this period was Cleveland winning the #1 pick in the NBA draft lottery an unprecedented three of those four years. 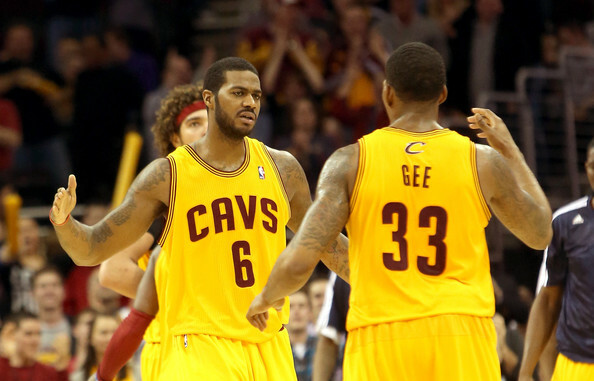 Even with an infusion of young talent, the Cavaliers made poor management decisions. Players didn’t always get along, and the locker room environment devolving into what one local reporter described as “toxic”. During the past couple of weeks there was a new form of hope that goes well beyond the good cast of young players they’ve recently put together. Former hometown hero turned native villain Lebron James appeared to have narrowed his destinations down to Cleveland and Miami, the latter with whom he won two championships in the four years between 2010 and 2014. It was almost time to make a decision. 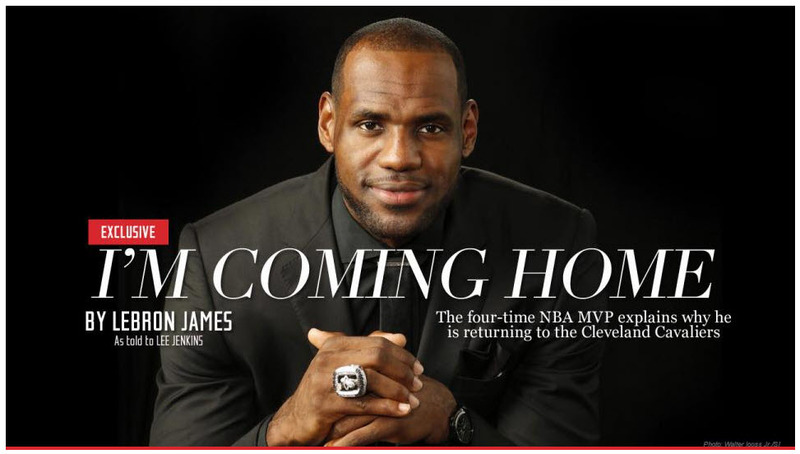 and it appeared that the best basketball player in the world might be coming back. What Cavs fan wouldn’t be excited? For almost a week, it was all about James decision. As of Saturday, all fans were at the edge of their seats just waiting for an announcement to happen. It got wild. 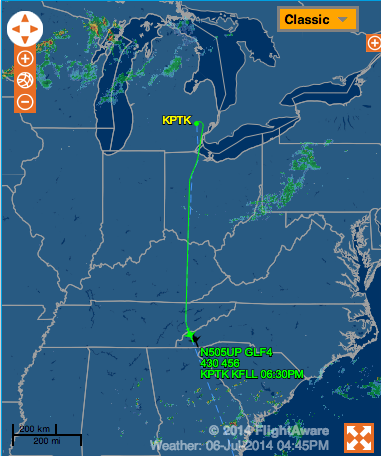 We, the fans, collectively tracked Cavs owner Dan Gilbert’s private plane as it criss-crossed the country, speculating about its trip to Miami. We updated our Twitter feeds and message boards constantly. People analyzed photos of exotic cars being loaded onto trucks in front of James’ Miami home. During this past week I listened to a lot more sports radio than I care to admit. Blog? I didn’t even read blogs, let alone write a post. Fans watched Owner Dan Gilbert’s plane make its way to Miami. While he denied being aboard it, he later confirmed that he indeed was traveling to Miami to meet with James and apologize for his angry letter. 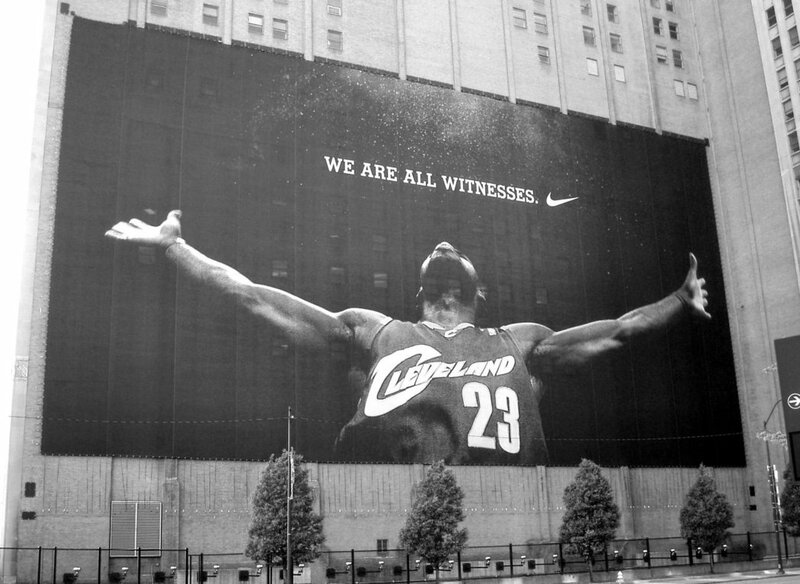 Then there were the local “insiders” who claimed knowledge that Lebron was 100% coming back to Cleveland. They ranged from a couple of legitimate reporters, to personal trainers, to a Cleveland cupcake store owner, and even a man who drives a bus that once had Lebron James’ mother’s sister in his car. Nothing was too outlandish for us. There were negative rumors of a return to Miami, too. We hung onto every word and read into everything, no matter how far fetched it seemed. Most signs seemed to point to a return to Cleveland, but how legitimate were they? All week, it always appeared that the decision was just one day away. Each evening since Sunday July 6, die-hard Cavs fans told themselves to wait until tomorrow. Tomorrow never came, until it did, on Friday. Let me say one thing – sports is not very important. Let’s be clear. Lebron James return is not going to, say, return the long departed manufacturing jobs to Cleveland or any other American city. While athletes have the potential to effect change with their celebrity, like Muhammad Ali, for example, sports themselves are not going to radically change society or solve the many threats that we face on this planet. Nothing serves as a substitute for making demands to those in power. On the other hand, sports does inspire cities, gives people hope and a sense of pride. Sports allots people an occasional, competitive getaway from their increasingly difficult daily lives. Sports are the ultimate competition, and as all of human history suggests, a part of our human DNA. Just look at today’s World Cup Final and its billion viewer audience. One advantage that competitions like the World Cup have over professional sports is that players play for where they are from – their teams are not arbitrary. It’s why high school sports fans are amongst the most passionate and dedicated that you will find. That’s what made Lebron James’ Friday decision to return to Cleveland so special. 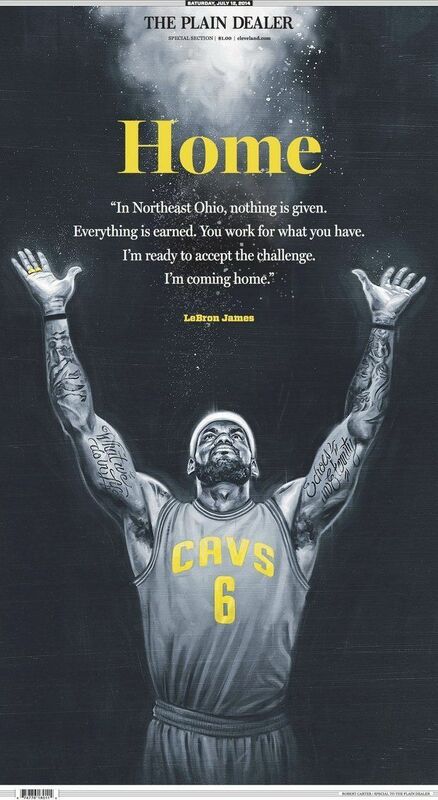 Through Lee Jenkins of Sports Illustrated, the nation learned that he is returning home to wear the banner of Cleveland and all of Northeast Ohio. His must-read letter to the region of his birth brought people to tears and is likely to appear on a plaque somewhere in C-Town, someday down the road. As he shed his villain status in a way no one has before, James explained in his letter how important home is. He explained how you don’t appreciate where you are from until you are gone, and how he’d like to impact the next generation of young people in his hometown. “My relationship with Northeast Ohio is bigger than basketball,” he declared, also stating that eventually returning to Cleveland to finish his career was a question of when, not if. The most suspicious observers – of which I am one – will point out that James’ decision to return home enhances his growing brand and popularity. It doesn’t come with economic sacrifice – quite the contrary. In fact, most observers agree that his only choices, in terms of his brand and public perception, were an aging Miami team lacking in assets and a return to up and coming Cleveland. And yes, he is also joining a strong, young team that is perhaps the most promising long term option in the entire league – whether or not they play in James’ home. Regardless of the less altruistic reasons that may have played a part in his return, it’s still a great pleasure to fans around the country to see the most talented athlete in the world go to their roots, especially in this world of media and entertainment syndication, the removal of anything truly local. James has stated the desire to send his kids to the same high school he attended, to be around family. Not in New York, Chicago or Los Angeles mega-markets, but in little Cleveland, on a quest to bring them their first championship in 50 years. Everyone likes an underdog, and it’s nice to see the little guy win sometimes. Especially when it’s your favorite team. David, I am happy for you. Not that I am a big sports fan, but if it was that important to you, I am glad it worked out. Selfishly, I am really glad it’s over because you will be blogging again – which I missed. I read your great article about the Cavs and I was just curious of why you picked the Cavs as your favorite NBA team when you were ten years old? You never stated why you picked the Cavs as a kid. Myself as a basketball fan, I always rooted for the Knicks as a kid, because of their stars back in the 50’s – 70’s era. I was born in NJ and I always root for the local area teams. Like a lot of kids – well, the ones that weren’t Jordan fans when I grew up in the 90s – I loved to watch Shawn Kemp and Gary Payton in Seattle. I was only a Sonics fan for a year or so when Kemp went to Cleveland, so it was an easy transition. I’m envious of people that can root for the home team like you :). I used to always wish the Nets the best in NJ but now that they’re in BK the Knicks feel lije the REAL home team to me. Dave You are right, I have known you since you were 10 years old and surrounded by Knick, Nets, Micheal Jordan, and Laker fans, You always persisted in reaching the Championship with Cav’s. Well I always liked the Celtics and Bill Russell, since the late 60’s and early 70’s……… stick with what makes you comfortable and root for team that touches your heart. Get Plainfield View Posts in your Email! Enter your email address to follow this blog and receive notifications of new posts immediately by email.